WASHINGTON – As new, alternative “meat” products make their way onto grocery store shelves, National Farmers Union (NFU) is encouraging federal officials to establish a definition for “meat” that fairly and consistently informs consumers about the difference between meat products that come from livestock raised in the traditional manner and alternative proteins that are created in a laboratory. Sioux Falls, SD – An upcoming series of webinars hosted by the American Coalition for Ethanol (ACE) will help educate ethanol plant management and staff on how to address cooling system capacity issues, which, according to statistics published by the U.S. Energy Information Administration and other agencies, result in lost revenue of $500 million. The series, titled “Essential Knowledge, Disciplines, and Practices for Managing Cooling Water Systems,” is being organized by ACE, Minnesota-based ACE plant member Chippewa Valley Ethanol Company (CVEC), and Solenis, a global leader in industrial water treatment. Other participants include technical experts from Brentwood Industries, Midwest Cooling Towers, and Trane. The webinar series consists of six, bi-weekly, one-hour sessions that will occur every other week at 2 p.m. Central starting October 10. Each webinar will be recorded and available online. These webinars will take a deep dive into ethanol plant cooling systems and highlight solutions related to cooling towers, heat exchangers, chillers, and water treatment. For more information or to register for the webinar series, visit ethanol.org/events/cooling. The current Farm Bill expires on Sunday, September 30th, 2018. Please ask your U.S. Senator and U.S. Representative to speak with their conference committee peers, and urge them to pass the Farm Bill before it expires. TAKE ACTION below. Your calls and emails matter! Only three legislative days remain for Congress to pass the Farm Bill before the 2014 version expires. Special Note: without passage by Sunday, funding to 39 programs will cease. This includes the Foreign Market Development (FMD) program. Unlike previous extensions in the farm bill’s recent history, any short or long-term extension of the 2014 Farm Bill does not continue FMD’s annual authorization of $34.5 million. The disruption in USDA resources comes at the exact time some of these programs (i.e. U.S. Grains Council) are preparing proposals for funding of the new Agriculture Trade Program (ATP) that is part of the Administration’s plan to mitigate the economic impact of retaliatory tariffs. Note: ATP funds cannot replace FMD funding authorized by the 2018 Farm Bill. In other words, FMD needs to be funded in order to administer the programs under the ATP. NISP Update: Submit comments before Oct 4th! The 29th annual South Platte Forum is coming up on October 24th and 25th at Embassy Suites in Loveland, CO. We are thrilled to announce a few more speakings that have been added to the exciting lineup this year. And don’t forget, register by October 1st to take advantage of the early bird rate. You’ve probably noticed the political ads filling up commercial breaks during the Broncos football game. It’s the season when political campaigns begin to amp up their advertising and boy oh boy are there a lot of things to vote on. This year, many advocates across the state gathered signatures to get their issue on the ballot. In fact, CFB was behind one of our very own — Amendment 74. To help inform your decision as you vote, CFB has put together a voting guide that shows the organization’s position on those initiatives. The Board of Directors voted on each decision based upon policy created by you, CFB members. As always, please reach out to staff with any questions. 09-25-18 Don’t Miss the Next CAWA Workshop in Glenwood Springs, CO on November 7th! Don’t Miss the Next CAWA Workshop in Glenwood Springs, CO on November 7th! 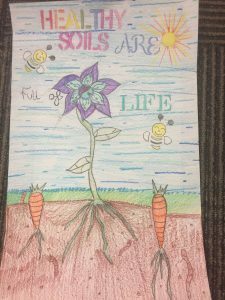 09-25-18 WGCD’s Annual Conservation Poster Contest – Enter by Oct 5th! If you have, or know, a 5th or 6th grade student who loves art and cares about conservation, we invite him or her to participate in the WGCD/CACD (Colorado Association of Conservation Districts) Poster Contest: Watersheds – Our Water, Our Home. All submissions must follow the listed criteria and be to the WGCD office at 4302 W. 9th St. Rd., Greeley, CO 80634 before 4 p.m. on Friday, October 5th. The winning artists placing 1st, 2nd and 3rd from each grade level will be recognized and honored with their parents at the West Greeley Conservation District’s Annual Meeting and Awards Dinner on Thursday, November 8that Island Grove Regional Park – Event Center. They will each receive a cash prize and the two first place posters will be submitted to the state competition on November 29th. 09-25-18 Don’t Miss the 70th Annual WGCD Annual Meeting in Greeley, CO on Nov 8th – RSVP TODAY! You are invited to join us for dinner, awards presentations and a re-cap of 2017-18 activities & accomplishments. WGCD exists because of you. Come celebrate with us. Featuring pasture cropping pioneer Colin Seis and more than 50 breakout sessions discussing soil health, general no-till, regenerative grazing, technology, farm business, and more! August 6th-9th I was invited to participate in a small bus tour focused on soil heath. The group consisting of myself, area producers, and staff and board members of the Lower Arkansas Valley Water Conservancy District traveled to central South Dakota to see and hear from several members of the South Dakota Soil Health Coalition. Our first stop was the South Dakota State University, Dakota Lakes Research Farm located just east of Pierre South Dakota on the northern bank of the Missouri River. We were hosted by farm manager Dr. Dwayne Beck who has been running the farm since the early 1990’s. Dr. Beck was inducted into the South Dakota Hall of Fame in 2007. The Dakota Lakes Research Farm consists of 800 acres of land of which about 250 acres is irrigated. Additional land is rented for research purposes. The entire operation is managed using no-till techniques. Dr. Beck’s emphasis is on developing no-till systems for irrigated and dryland areas in central South Dakota. His primary achievements deal with development of programs that have allowed producers to profitably adopt no-till techniques in a large portion of central South Dakota. Identification of the extremely important role played by crop rotation in minimizing weed, disease, and insect problems while increasing potential profitability was the key contribution of this project. BROOMFIELD, Colo. – It’s that time of year when leaves change color, the air is crisp and families venture into pumpkin patches and corn mazes. To help people experience agriculture in the state, the Colorado Department of Agriculture lists a variety of fall activities online at www.coloradoagritourism.com. “Put this one in the bag and keep hunting for more,” says Agriculture Secretary Sonny Perdue of the signing of an updated trade agreement between the U.S. and South Korea. President Trump signed an updated United States-Republic of Korea Free Trade Agreement, known as KORUS, Monday. Perdue says of the agreement that it adds to the “the momentum building for President Trump’s approach to trade.” In his statement, Perdue says that he is optimistic “the dominoes will continue to fall,” referring to the North American Free Trade Agreement, and new agreements with the European Union, Japan and even China. The new KORUS agreement is a “better deal for the entire United States economy, including the agricultural sector,” according to Perdue. The White House says the agreement is a sign that President Trump has “fulfilled his promise” to fight for American workers and businesses in an amended trade deal with South Korea. Hopes of an on-time farm bill are diminishing as lawmakers now have less than a week to finish a bill, get it passed by both chambers again, and on the President’s desk for signature. The current farm bill expires September 30th, and the conference committee still must agree on changes in the conservation programs of the farm bill and the nutrition title. Top agriculture lawmakers don’t seem to be concerned, but farm groups are sounding the alarm bells as Congress runs out of time. Senate Agriculture Committee leadership last week said the real deadline that would impact farmers is in December. But, as Politico points out, many programs would be left in limbo regarding funding. For instance, mandatory funding is available for conservation programs, but without a farm bill, the Department of Agriculture’s authority to operate the programs expires. The bill’s Foreign Market Development program, deemed critical to developing new trade markets, could also lose funding. Lawmakers have yet to make any serious considerations towards extending the current farm bill to allow Congress time to deliver the next. Stalled talks between the U.S. and Canada regarding the North American Free Trade Agreement are expected to continue this week, as the U.S. desires to reach a deal by September 30th. Informal talks are likely over the next few days, according to Reuters, as global attention turns towards a U.N. meeting this week. Canadian Prime Minister Justin Trudeau (True-doh) says nothing had formally been arranged for this week, however, leaving further uncertainty as to whether the U.S. will continue to seek a trilateral agreement. The U.S. appears likely to forge ahead with a U.S.-Mexico only trade agreement until the U.S. can reach an agreement with Canada beyond the September 30th deadline. Trudeau offered some pushback over the weekend, saying Canada would not be rushed into reaching an agreement and that he would not sign “a bad NAFTA deal.” Dairy market access remains a sticking point between the two nations, among a handful of other remaining issues. The escalating trade war between the U.S. and China continues to pose long-term harm for U.S. soybean farmers. The American Soybean Association says recent decision by the Trump administration to impose ten percent tariffs on an additional $200 billion in Chinese imports—and China’s subsequent retaliation on $60 billion of U.S. products—deepens and prolongs the trade war between the two countries, posing even more adverse consequences for American soybean farmers. ASA points out that since June, the price of U.S. soybeans at export terminals in New Orleans has dropped 20 percent, from $10.89 to $8.68 per bushel. Farm-gate prices have fallen even further. During the same period, the premium paid for Brazilian soybeans has increased from virtually zero to $2.18 per bushel, or $80 per metric ton. ASA has urged the Administration to quickly end trade disputes, reconsider joining the Trans-Pacific Partnership, and has asked Congress to double funding for the Foreign Market Development and Market Access Programs for export promotion activities. Late last week, the Department of Agriculture announced the inclusion of shelled almonds and fresh sweet cherries to the trade relief package. The relief package provides growers with funding through the Market Facilitation Program to help offset harm producers are facing by the administration’s trade agenda. Producers of shelled almonds and fresh sweet cherries may apply for payments at their local Farm Service Agency. The initial payment rates for shelled almonds is three cents per pound, and the rate for fresh sweet cherries is 16 cents per pound. USDA also has expanded the timeline for producers with whom the August 1, 2018, date does not accurately represent the number of head of live hogs they own. Producers may now choose any date between July 15 to August 15, 2018, that correctly reflects their actual operation. Market Facilitation Program applications are available online at www.farmers.gov. Pork production is accelerating, prices are lower, and demand is improving. New Data from the Department of Agriculture shows that lower pork prices this year have encouraged domestic and foreign consumers to buy more U.S. pork. Meat industry publication Meatingplace reports 2018 total cold stocks of pork have remained at or below three and five-year averages so far, and large supplies of hogs are expected to keep hog prices significantly below year-ago levels through at least the first half of 2019. Even with the current trade climate, July pork exports were almost nine percent higher than a year earlier. Third-quarter pork exports are expected to be 1.3 billion pounds, almost six percent higher than in the same period a year ago. Pork exports were stronger despite lower shipments to Mexico and China, both of which have imposed retaliatory tariffs on U.S. pork products. July exports were supported by strong shipments to South Korea, Japan, the Philippines, Australia, and Colombia. USDA will release its quarterly Hogs and Pigs report this Thursday, providing more pork production insight.